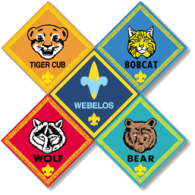 Arrow of Light and Webelos Den's have been invited by Troop 94 on February 9th to go with on their annual bus trek to see the Hershey Bears play at the Giant Center vs Binghamton. Depending on the amount attending they may open it up to other den's. Tickets will be purchased and paid for in advance. The cost of the ticket is $ 28.00. If you are interested in attending the game please submit the number of tickets and money paid no later than November 26th. Akela's must attend with there scout. Sign up's can be found here.